The disclaimer on our clients' RoadMaps needs to be updated. How can we do this? 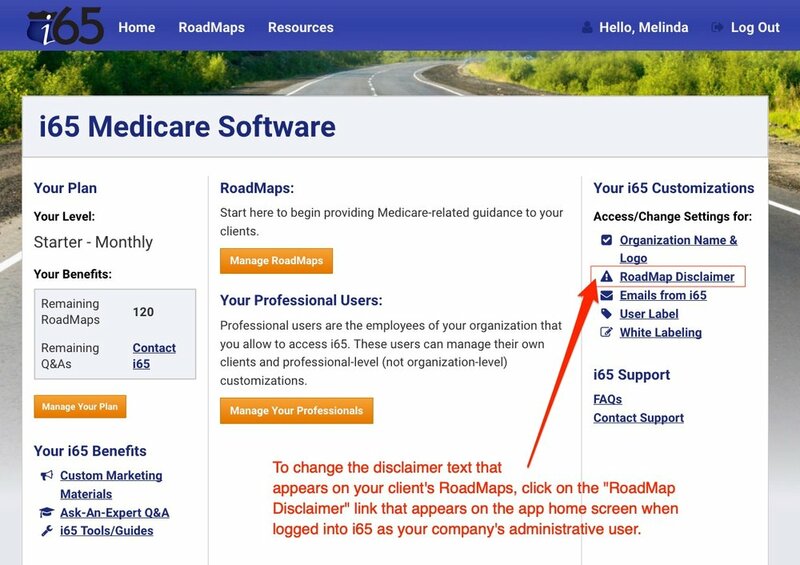 To change the RoadMap disclaimer, be sure you're logged in as your company's administrative (master) user. Once you are logged in, you'll see several links under the "Your i65 Customizations" header on the right side of the screen. In this list, click on the "RoadMap Disclaimer" link. Make any/all changes to your disclaimer as needed and click "Save." I have a couple coming into my office that would like my help with Medicare. Do I have to run both individuals through i65 or can I just do one RoadMap? (Created on 11/1/2018) Unfortunately, the answer is that it depends on the individual clients. When you initially take clients through i65, you're presented with five general options to choose from that best represent the client's current situation. (Refer to Illustration 1) If both spouses select the same option and have relatively similar health and travel habits, you could potentially run just one RoadMap. However, be sure to note that the Initial Enrollment period calendar, special enrollment period calculation, and the step-by-step Medicare enrollment instructions may not be accurate for both spouses. If the clients choose different options (Refer to Illustration 1), have different health or travel needs, it's much safer to run reports for both spouses. 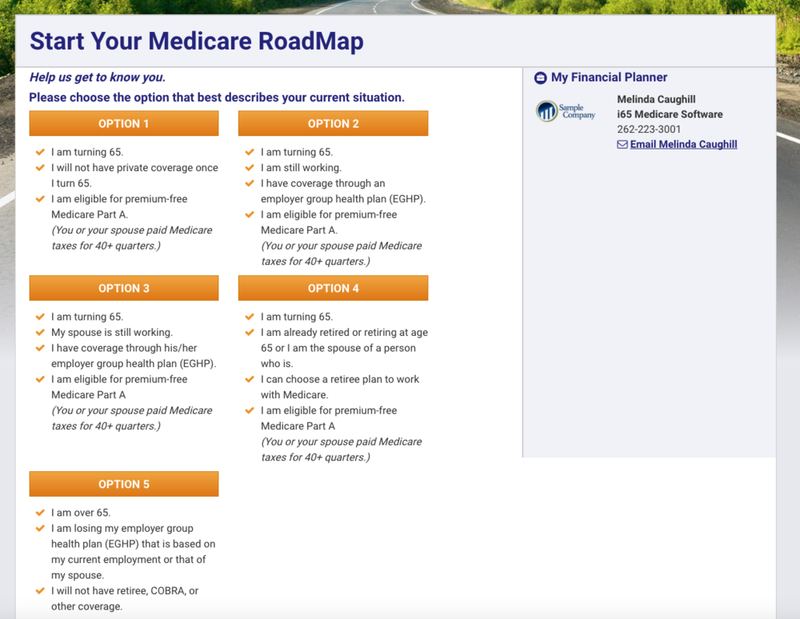 How do you allow clients to access their RoadMaps, as well as all the Medicare tools and resources available through i65 Medicare Mapping software? 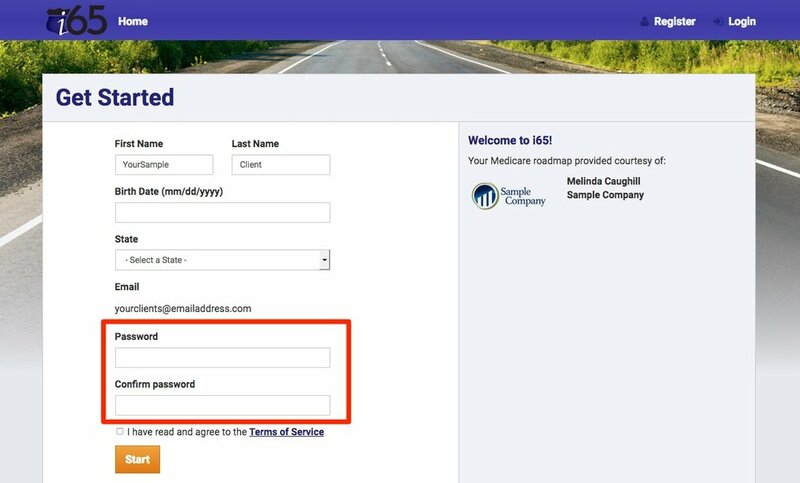 In this short video, Melinda Caughill, Co-Founder and CMO of i65, walks you through how to give or revoke client access to i65 by simply checking (or unchecking) the "Allow client to access i65" box. For more questions or support, please reach out to the support team. 1:15 – Should you immediately give clients the ability to access i65? I need to update the phone number that appears in my clients' RoadMap reports. How do I do this? Each professional user assigns their own contact information that is not specifically set up on the organizational level - including phone numbers. 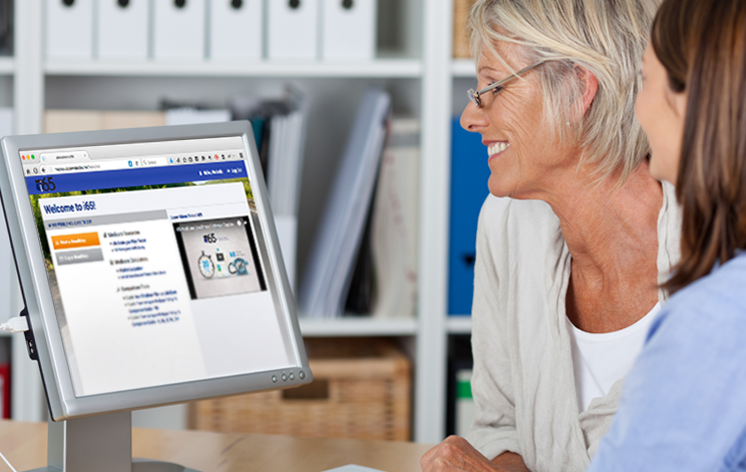 To change any user-level contact information, be sure you're logged in as the professional user that needs to update his/her information. Then, head to the "Hello, <First Name>" link in the upper-right corner of i65. In the next screen that appears, update the contact information as needed. Please note: The contact information will appear exactly as typed in the RoadMaps of clients. Take care to ensure that this information is as you would like it to appear. I cannot remember the sample password I used when I created my client's i65 account. What do I do now? Head to the i65 login page. (You can reach the log in page from the main navigation bar on www.i65.com) On this page click the "Forgot Password" link. Use your client's email address and click the "Reset Password" button. Your client will receive an email with a link to reset their password. QUESTION: I’m trying to figure out how I view and edit a client's that I’ve already set up in i65. How do I do this? When you've already created a client's account, you will need to use their user ID (email address) and their password to log into their account. The link that you initially used to create their account will no longer function after the client's account has been created. 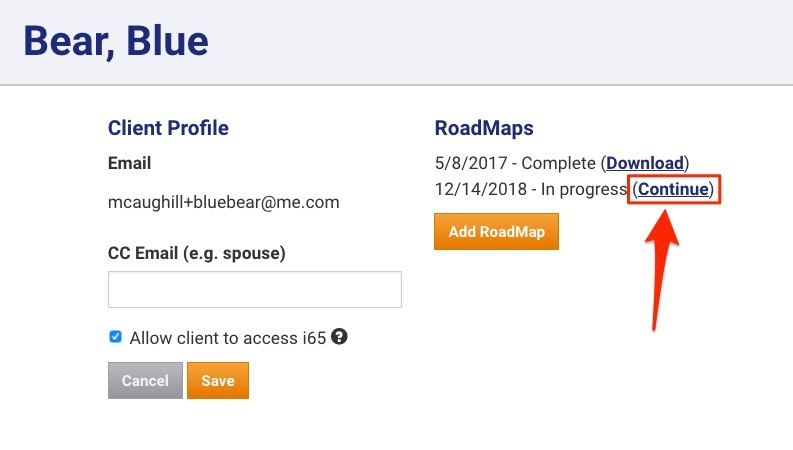 1) While in "Manage Clients" tab of your admin or professional user account, click on the "Add Client" button to add a new client to your i65 account. 2) In the screen that comes up next, add your client's first name, last name and email address. 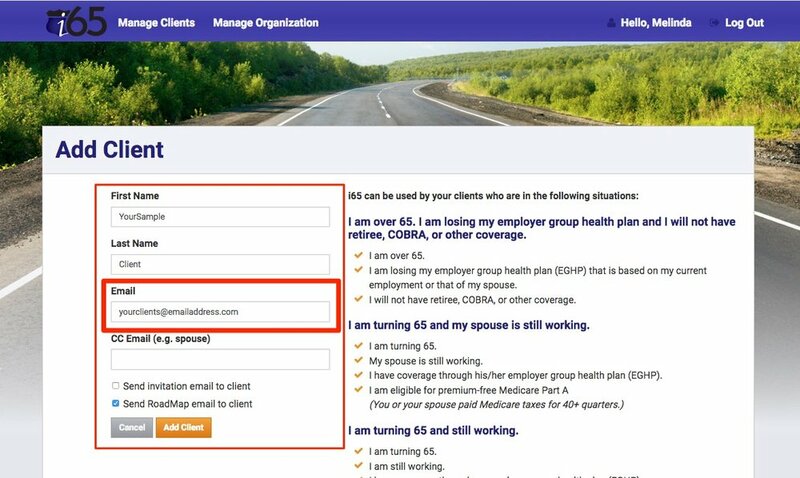 If you'd like to use i65 in a one-on-one consultation setting (highly recommended for financial advisors), leave the "Send invitation email to client" box UNCHECKED. Please note: If you leave both boxes unchecked, your client will not receive any emails directly from i65. IMPORTANT: If you are allowing your client to run through i65 on their own, you will stop at this step. Your client will proceed through the following steps on their own. 3) After clicking the "Add Client" button in the previous screen, you'll be taken to a page that looks similar to the image below. On this page, you'll be provided with a link to set up your client's unique i65 account. 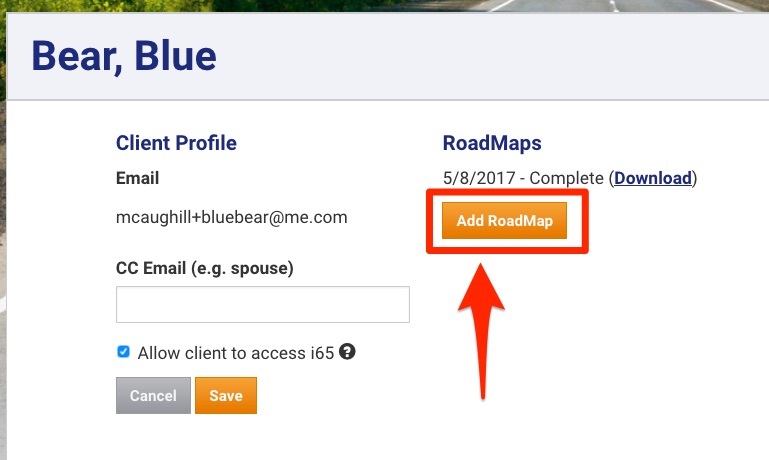 When you click on the link on this page, you'll be automatically logged out of your user/admin account and you'll begin setting up your client's account. 4) On the "Get Started" page, you'll offically create your client's account by creating a sample password for your client to use initially. 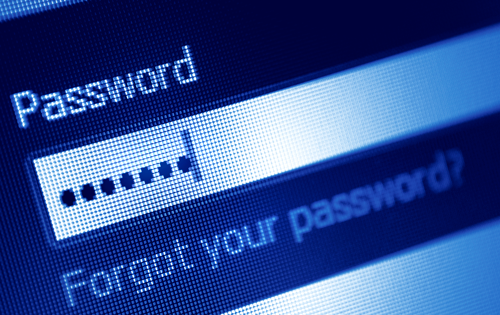 We highly recommend using the same sample password for all of your clients. It will make it easier for you to log in as your client later. Please note - Your client will have the ability to change their password, if they so choose. 5) Once you've clicked the Start button in the previous screen, you will be able to i65 with or for your client. You may also choose to log out at this point and return at a later time to complete the i65 Q&A process. 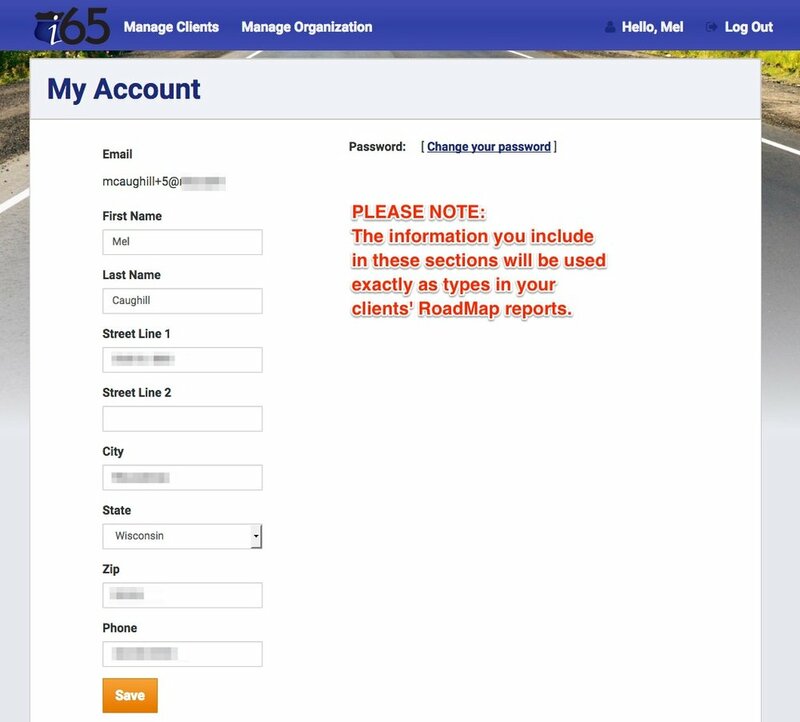 The following steps, 6 - 7, will walk you through how to log into i65 as your client. To return at a later time and log in as one of your clients, please follow these remaining steps 6) Go to www.i65.com and click on the "LOG IN" link located in the upper right corner of the page. 7) Enter YOUR CLIENT'S EMAIL ADDRESS and the sample password you chose in Step 4. IMPORTANT: If you've forgotten the password you used, you will have to rely on your client to help you reset the password using the "Forgot Password" steps.